Cooking with stevia does require a learning curve, but since the advantages of reducing sugar in your diet (as well as eliminating your consumption of aspartame and other artificial sweeteners) are so important, it’s well worth the effort. The most important thing to remember is not to use too much, which can result in excessive sweetness and an aftertaste. Always start with the exact amount called for in a recipe, or even a little less, then taste before you add any more. Stevia is delicious in almost any recipe using fruit or dairy products, but does present a bit of a challenge when used for baking, since it lacks sugar’s abilities to add texture, help soften batter, caramelize, enhance the browning process, and feed the fermentation of yeast. On the other hand, one of the excellent facets of stevia is that high temperatures do not affect its sweetening properties. You may find that mixing stevia with other sweeteners, like honey or maple syrup, is a good way to start using stevia. It will enable you to reduce the amounts of these other sweeteners (as well as calories) while getting used to cooking with this wonderful herb. The recipes we’ll be posting here call for the white stevia powder or the liquid concentrate made from that powder. Other varieties of stevia can be used in cooking as well, but require different amounts. Also, keep in mind that dried or powdered leaves will not dissolve in liquids, and thus are not suitable for beverages. Here’s an easy recipe to start with. Pour into ice-filled 10-ounce glasses, garnish with lemon slices, and serve. I make sugar syrups. Recipe: 1kg sugar, 500ml water, 10 gram lemon, and then flavour it with different natural flavours. Now, I wanna make syrups using stevia powder. Want to know how much stevia powder to use in place of sugar for 500ml water? 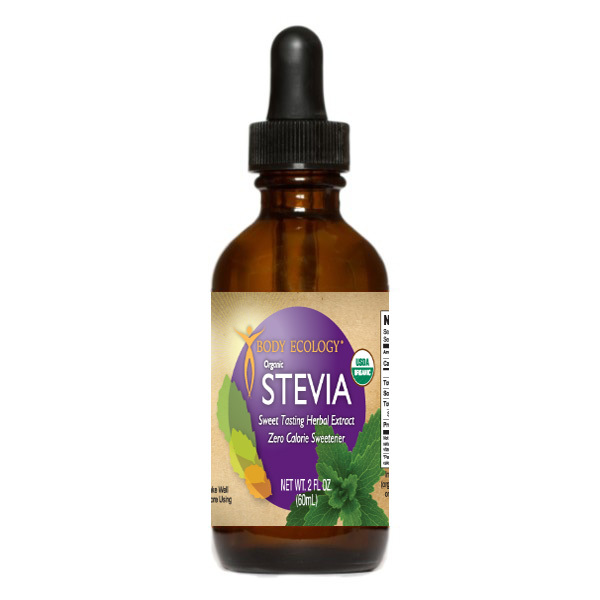 If I boiled stevia with water and a few drops of lemon juice, can I get a thickened syrup ? As the regular thick syrups used in oriental dessert ? I tried using stevia to bake cookies, I creamed stevia with butter and then added dry ingredients. I used half the required amount of sugar as per label on stevia packet so as not to be too sweet. After baking the stevia appeared to be still granulated and the cookies were so crumbly that you couldn’t pick them up. It also had a strong aftertaste. I LIVE IN AUSTRALIA AND I NEED TO FIND OUT HOW TO REPLACE GRANULATED SUGAR WITH STEVIA TO MAKE BISCUITS. HOPEFULLY SOMEONE HAS A RECIPE I CAN USE. Stevia need not be creamed with butter. Add while you mix in the dry ingredients. Also, try adding very little (not more than a teaspoon or 5gms) of guar gum to the recipe as this helps in providing a little more structure to the cookies. As for the aftertaste, you have to tweak your recipe before you find the right concentration of stevia to be added as adding too much stevia gives the bitter after taste. I used half the required amount of sugar as per labor on stevia packet so as not to be too sweet. I do a lot of baking during the holidays and my boyfriend is diabetic. How much does 1 cup of sugar equal to one packet of Stevia? Can I buy Stevia in bulk either on line or in store? I would like to try baking with Stevia but not sure the correct quantity of Stevia to use in any recipe I use to substitute for sugar. Stevia Baking Blend still contains sugar. Be sure to check sugar content carefully. Dissolve 2 tablespoons of cornstarch in 1/4 cup Ice water, stir to mix, then set aside. Make sugar syrup with 1 cup water, 1/2 cup sugar, 2 tablespoons plus 1 tsp. stevia in sauce pan. Heat until all is dissolved and quite hot. Add 3/4 cup frozen blueberries and cornstarch mixture to hot syrup mixture; stir to mix. Slowly bring to boil, stirring often to keep cornstarch from forming lumps in bottom of pan. Just before serving and while still quite hot, add another 1/4 cup frozen blueberries to add the fresh, uncooked blueberry taste to your syrup. I would like to know if Stevia can be used to bake an apple pie? Can it be used to make cranberry sauce for Thanksgiving? How much Stevia in the powdered would someone use to equal a cup of sugar? What are the best dry bulking agents to replace the amount of crystallized sugar being omitted for the Stevia? I’ve heard about applesauce which is an oil replacer, eggs would seem to add too much moisture even though I use flax, water is too much liquid and I use tofu but that requires more sweetener. Hi guys, you might wanna ask these questions on Yahoo… that is if you already have an account. I don’t know very much about this *sarcastic voice* MYSTERIOUS plant, but I’m just saying that it may be helpful to go on Yahoo. Or maybe Wikipedia if you need to know more facts on stevia, but I would certainly NOT resort to any news flashes or ads that say stuff like “SHOCKING DISCOVERY: Stevia’s Side Affects Cause Health Problems!!!! !” ‘Cause those sources almost always lie; the ones that say “SHOCKING” are (what I have found so far as) phony and make people choose something without giving any real scientific evidence. So just please do not fall for those ads because they are just… idiotic, and the people who created them probably just want money from you visiting the cite. So… just lettin’ ya know: don’t waste your time and the valuable info of the internet on checking out random ads. Just know your facts and trust yourself with your own knowledge. If you don’t… well, Wikipedia is always there for you. Can Stevia be used in oven over 400º in baking products? I am going to share a recipe with you because I would like to know what amount of the stevia to use to replace the sugar. My husband was just diagnosed with diabetes and I need all the help I can get. 4 eggs or 4 Tbls ground golden flax Plus 3 Tbsp water for each Tbls of flax. The flax is a binder just like eggs are but without the cholesterol. For two large loaves bake for 45 minutes to an hour. For four small loaves bake for 30 to 45 minutes. Please let me know how much stevia to use in place of the sugar. Seriously, lose this recipe. Thr flour, bananas, and pineapple also send blood sugar soaring. Yes, please lose this recipe it has way too many carbs. Your best bet would to be a low carb diet. If you really need something sweet make a cheesecake using Stevia. what is substitiution if using Stevia packets (i gram) instead of the liquid concentrate? I am looking for a recipe for cheesecake made with Stevia. I have made cheese cake just using a regular recipe, omitting sugar and adding Stevia to taste. I add a little, taste and add more until it tastes right. Just start with a small taste and then add what you think you need. I have just found out about Stevia,so i have been out and bought a Stevia plant.How would i use this for sweetening tea and coffe ? I had the same question. I also bought a plant. I thought I could just ‘muddle’ some fresh leaves in the bottom of my glass, like you would mint, but it doesn’t seem to release the sweetness. If I just chew up a leaf, it’s very sweet and wonderful. I was trying to sweeten iced tea… Maybe hot would release the sweetness better? I read on this site that you are suppose to dry the leaves first. Grind them up and then you can add warm water to the dried leaves and let it set overnight and then use the sweetened water. I think I’ll look around a little more on the internet for some more tips. Good luck. Hi, i thought i would try stevia,i found some small sugar packets (like sugar pkts)for adding to tea or coffee. but could be increased very easily. 1 TBSP powdered stevia mixed with 2 tsp. water. Cook down the berries until mixture has thickened, Start with low temp and increase to medium after juice has formed. After this has thickened, you should be able to see the mark of a spoon across the bottom of the pan. Let cool to warm and add the stevia mixture. This is thick enough to use as a preserve with toast or as a topping for homemade yogurt (made with stevia). Looking for any recipes for making any syrups from stevia ! I would like to know if you can use stevia to make the syrup for preserving fruit. i love this recipe. i use stevia all the time. can’t wait to try more recipes.